This is a strange picture for Photo Friday, I realize, but this week’s Ricky Tims’ Photo Challenge photo was of my daughter and I have a “no kid pics on the Internet” rule. Instead, I am sharing a picture of her birthday cake. She asked for a “rainbow cake with cloud frosting,” which she had seen in a cartoon about a little girl with wish magic. I was a little worried when she asked because I don’t have wish magic and didn’t have any idea how I would create such a thing. But, there are plenty of videos and recipes online showing how to make this and it was incredibly easy. It’s a double batch of yellow cake, split into 6 portions and colored, then baked in 2 rounds of 3 pans for 20 minutes or so, layered with 3 batches of sour cream frosting. 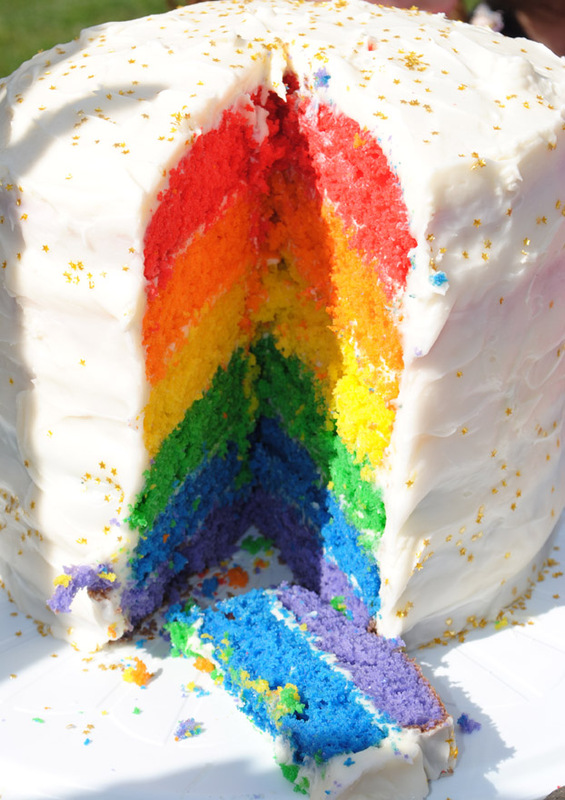 Truly, not that much more difficult than a regular cake so I’m planning a red, white and blue one for July 4th.